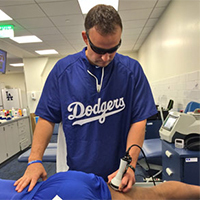 Steve Smith is head physical therapist for the Los Angeles Dodgers. Prior to joining the big league team he spent two seasons as the organization’s Medical/Rehabilitation Coordinator. Previous to that he was the Manager of Performance Physical Therapy at Athletes’ Performance (EXOS) Florida in conjunction with Dr. James Andrews and the Andrews Institute. A native of Hagerstown, MD, Smith earned his Master’s and Doctorate degree in Physical Therapy from the University of Maryland Baltimore. He also earned a Bachelor’s degree in Biological Sciences from the University of Maryland Baltimore County. He is a Board Certified Specialist in Sports Physical Therapy (American Board of Physical Therapy Specialties), a Certified Strength and Conditioning Specialist (National Strength and Conditioning Association), and an Emergency Medical Responder (American Red Cross).